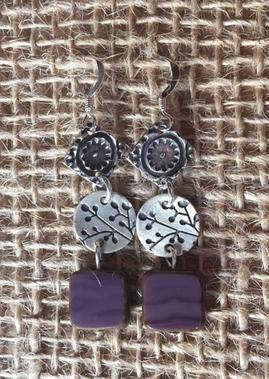 Brenda Scholl learned about Precious Metal Clay (PMC) from a dear friend of her mom’s named Heather Wales. She was teaching a PMC class that Brenda attended. She had so much fun and was fascinated with the idea of clay that once fired was pure silver! Brenda started to research and buy the tools to start making jewelry at home. 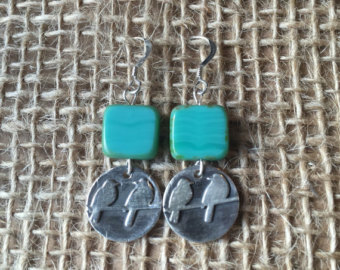 She fell in love with it and her family and friends encouraged her to start to sell her beautiful, creative jewelry. Brenda started looking for events and now it is her full-time job! Her jewelry makes it possible to be a stay at home mom to her one-year old baby girl. Brenda loves that she can stay at home with her during the week and make jewelry and then on weekends she attends various events all over eastern PA! 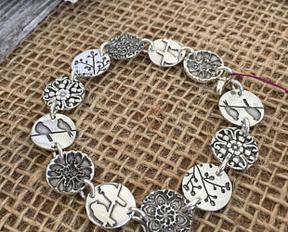 PMC is made using recycled silver from the backing of old film such as X-RAY film. It is put through a chemical process that turns the silver into a powder form. The Silver is then mixed into clay that acts as a bonding agent for the silver. The company that makes the clay Brenda uses is Mitsubishi Materials in Japan. 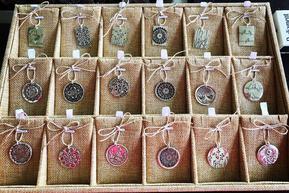 The type of clay she buys is created so that after the firing process what is left is .999 Fine Silver or 99.9% silver. This is purer then sterling silver which is .925 or 92.5% silver. Because there are less alloys in the metal the silver doesn’t tarnish the same way sterling does. It antiques with time but is very easily cleaned with a silver polishing cloth. First, Brenda rolls out the clay using a hand roller and uses cards to gauge the thickness of the clay after its rolled out. Then using various stamps and textures she can press a design into the clay. What is neat about the fact that it is clay is that you can use anything to put a design into the silver, even your fingerprint! Next she uses tiny “cookie cutters” to cut out the shape of the design that is wanted and the cutout piece is placed into a dehydrator. The clay has to be completely dry before firing or else it will explode! Once dehydrated she uses a Dremel to smooth the sides of each piece and then holes are drilled where the jump rings will be attached. The pieces get fired using a propane torch on a firing block. As the piece heats it will catch fire which is actually the clay itself burning off. This is a bit tricky because if you accidentally concentrate the heat for too long the silver with melt and turn into a puddle! The piece shrinks down and turns bright red. At this point it is no longer clay it is .999 Fine silver! After the pieces cool, a chemical called Black Max is applied to the surface where the design is. This oxidizes the silver and highlights the design. A dremel is used to buff off the surface so that the silver that is oxidized is only in the design ensuring that the rest of the piece will be shiny bright silver. Last, the pieces go into a jewelry tumbler with silver cleaning liquid and tiny bits of stainless steel. This process takes 4 hours. When the pieces come out of the tumbler they are mirror shiny! All that is left to do is assemble the pieces using jump rings and chains and earring hooks! FEATURED VENDOR for the Festival that year.